The founders (1972) of this federally recognized seminary known as The Alliance of Divine Love Ministry are Rev. 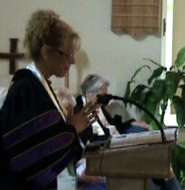 Dr. Barbara Selwa, President, and the late (2011), Rev. Dr. Barbara Hanshaw. The ministry has had 2,000-plus ordained ministers (2018) throughout the United States, Canada, Mexico, Equador, China, England, India, Australia, and Germany. The mission quest of The Alliance of Divine Love is to teach Love in The Greatest Degree; spreading a message of Oneness that all people are of one spiritual family regardless of religious beliefs, traditions, ethnic origin, gender or culture. This unique, integral or interspiritual ministry does not hold dogmas or doctrines; it teaches and preaches unity in diversity - that we are ALL one, and that Divine Love is the supreme spiritual law of the Universe. Rev. 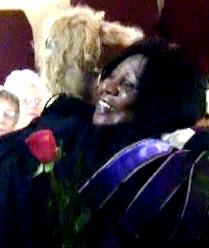 Dr. Nancy Ash enjoys the blessing and honor to ordain into the ministry, The Reverend Bobbie Powell of Forrestville, Arkansas (pictured above) at the beautiful conference in South Florida, April, 2011. The Reverend. 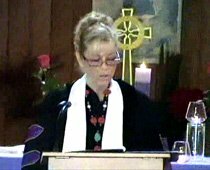 Dr. Nancy Ash leads the entire congregation in reciting the Alliance of Divine Love Ministry "Oath of The Rose"
Thank you for supporting my ministry. Every donation - even small - is a God-send. Secure with Paypal. Heartfelt Blessings with Love! Our beloved ministry co-founder, the late Reverend Dr. Barbara Hanshaw (left) with Rev. Dr. Linda Nelson, confer the Doctor of Divinity Degree in Metaphysics and Spirituality to Rev. Dr. Nancy Ash as she recites the oaths and receives her diploma. Sadly Barbara passed from this plane just three weeks later. It was her last official ceremony with us. Thank you so much for visiting today. I've been a part of this unique interspiritual ministry since 1998. If you feel called to serve your community and the world by entering our training program, I'd be honored to assist mentoring you towards ordination. Quite frankly, an interspiritual ministry will absolutely change your life expanding new and beautiful vistas of consciousness. And, we need YOU. The world needs your light, your SOUL! We are all awakening…and we're all growing up. Have courage. As I wrote in my first book, "If I can do it…you can do it."